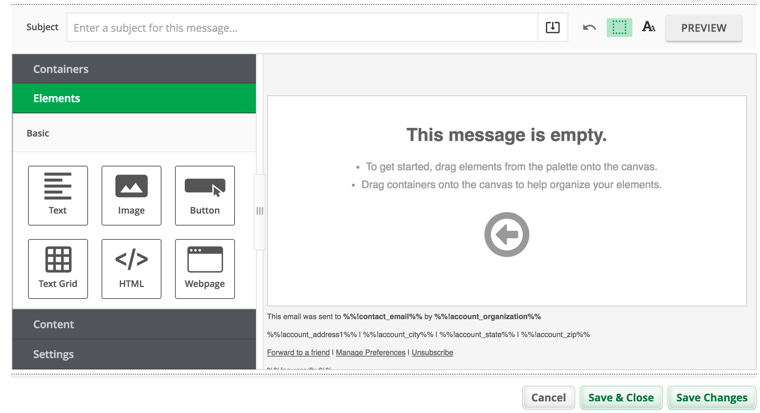 Bronto's new message editor provides a simplified drag-and-drop experience while still maintaining all of the complex functionality of the legacy message editor. All new messages created with an editor will use the new message editor. All existing messages edited with an editor will use the legacy WYSIWYG editor. For more information about the WYSIWYG editor, see Create Email: WYSIWYG Editor. The canvas is where you place elements in order to design the body of your message. The palette is where you select and edit the elements of your message. This topic walks you through the basics of using the message editor to build an email message. The Containers palette has containers that you can use to structure your message. The Elements palette is where you can access the tools you need to add content to your message. The Content palette is where you can access and save templates that you can use to build your messages. The Settings palette allows you to manage your message at a high-level. The Design menus are how you can format all of the containers and elements in your message. A Gmail annotation lets you include images, deals, expiration dates, and other offers with your marketing email to help engage contacts. You can only use Gmail Annotations with the Email Message Editor. With CSS, you can use media queries to create messages that can be displayed with the optimal design for the device that your contact opens the email with. Because desktop versions of Microsoft Outlook do not support responsive design, some elements of a message you create with the email message editor may not appear as expected when a contact opens the message in Outlook's desktop client.